A garage door serves multiple purposes. From being a security enhancements that helps protect your stored belonging, along with your car, to a convenient entry point that saves you time and effort each morning and evening. Therefore, the door should be able to function with as few issues as possible, and it should be a perfect fit for your surrounding conditions. The material the panels should be made of will depend on several factors, including what you're hoping to get out of the door. Here is a short overview of the most commonly used materials. A steel garage door can be an excellent choice for homeowners who are looking to bolster up the security of their homes. Seeing as this would be the largest access point to your house, it stands to reason you'll want it to be as strong and durable as possible, to ward off unwanted visitors and burglars. That's exactly why steel is a great choice. It offers those attributes, and it can also be attached with a faux-wood exterior panel, which will lend it presentability without compromising security. 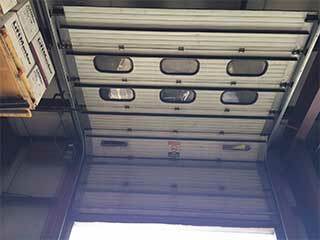 The only two downsides that a steel door presents is the potential to rust and heavier weight, which will require a more powerful opener. If those aren't factors you're concerned about, then steel would be a great choice for your home. Wood is the natural choice (literally) for those looking for a garage door with curb appeal that can raise the monetary value of their home, as well as its visual one. Wood isn't just beautiful, it is also a natural insulator, which can translate to lower energy bills if it does its job adequately. A wooden garage door can give your home that classic look that so many homeowners are yearning for. Just remember, rot requires a lot of maintenance, and will require regular repainting in order to be preserved. An aluminum garage door makes a great choice for those who want to spend as little money as possible, while still getting a door that can be versatile and beautiful (with the right exterior layer). The main benefits of aluminum is that it barely requires any maintenance, and that is very lightweight, which means it won't require a powerful opener to move. However, it will damage quite easily, and will not be able to provide the same security and curb appeal benefits its counterparts will. There's no reason for you to make an uniformed decision. If you're not sure exactly which garage door material is going to be the right fit for your needs, give our team a call and have our experts consult you on this important subject. Rest assured that we'll be able to happily answer any questions you may have.